Plymouth Harbour is famous as the starting point for many pioneering and historic voyages and the voyage of the Pilgrim Fathers in the Mayflower was one of these epic journeys. The Mayflower sailed from Plymouth in 1620, bound for the new world of America with 102 passengers. 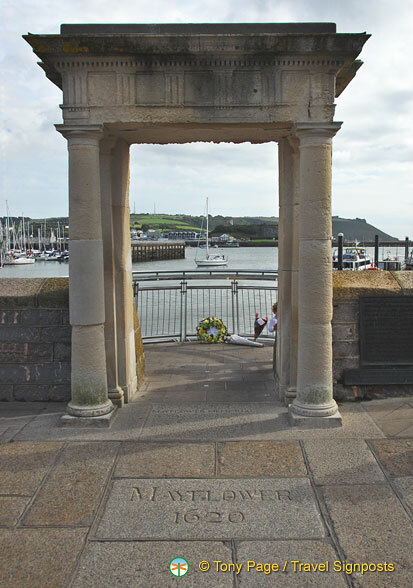 Flanked by the flags of Britain and America, the Mayflower Steps is a memorial commemorating their brave voyage. The Pilgrim Fathers were mostly Puritans looking for a new life away from religious persecution by James I. They originally sought sanctuary in Holland and were now looking to colonize new lands and create a community of their own. The Pilgrims had intended to settle in Virginia but stormy weather and the rough crossing forced them to land at ‘New Plymouth’ in Massachusetts. A list of Mayflower Pilgrims, printed on a wooden board, can be seen on the wall of Island House in the adjacent street. Incidentally, Island House is also where you can try some Pilgrims ice cream. The original steps from which the Pilgrim Fathers embarked no longer exists but a granite block in the pavement with the ship’s name on it marks the approximate site. A nearby tablet commemorating the voyage was erected in 1891 and the sand-coloured Doric portico was added in 1934. Step through this portico and you’ll be standing on a small balcony with views out towards the sea. This was added in 2000. Mayflower Steps - Plymouth Barbican.. Nearby to the Mayflower Steps are numerous plaques and tablets that chronicle other major events near the site such as the departure of the ‘convict ships’ for Australia, the departure of the Tory – the pioneer ship that left to colonize New Zealand and the arrival of the first transatlantic American seaplane in 1919. If you’re interested in learning more about the voyage by the Pilgrim Fathers in the Mayflower or about the lives of the merchant families, Plymouth’s fishing industry, Sutton Harbour, the naval harbour and the development of The Barbican over the centuries, the Plymouth Mayflower building houses an interpretation centre with three floors of exhibition space. From April to October, boat trips leave from the Mayflower Steps and Phoenix Wharf offering a sea view of Plymouth. One-hour cruises take you to the dockyard and warships in Devonport – longer cruises go further up the River Tamar. For more photos of the Mayflower Steps and pictures of Plymouth, see Travelsignposts Plymouth photo gallery HERE.